I don't know how my latest obsession took so much time to come around. I've been in Stockholm for over 2 years and I discover kanelbullar (cinnamon buns) now? The best ones I've eaten are of course homemade -- my husband's sister and grandmother both bake excellent kanelbullar. Nowadays I examine every bakery to see how the cinnamon bun looks, because not all are created equal -- I've tried some dry chewy ones, which certainly are not worth the fat. So far, Fabrique bakery makes the best kanelbullar -- scented with cardamom and cinnamon with a distinct buttery crust. Kanelbullar (Kanel means cinnamon in Swedish and bullar means bun) here in Sweden are more like a bread -- not too sweet, not too rich, just enough cinnamon, often scented with cardamom as well, and a perfect accompaniment to coffee = fika time (usually around 3 or 4 but there are no rules). 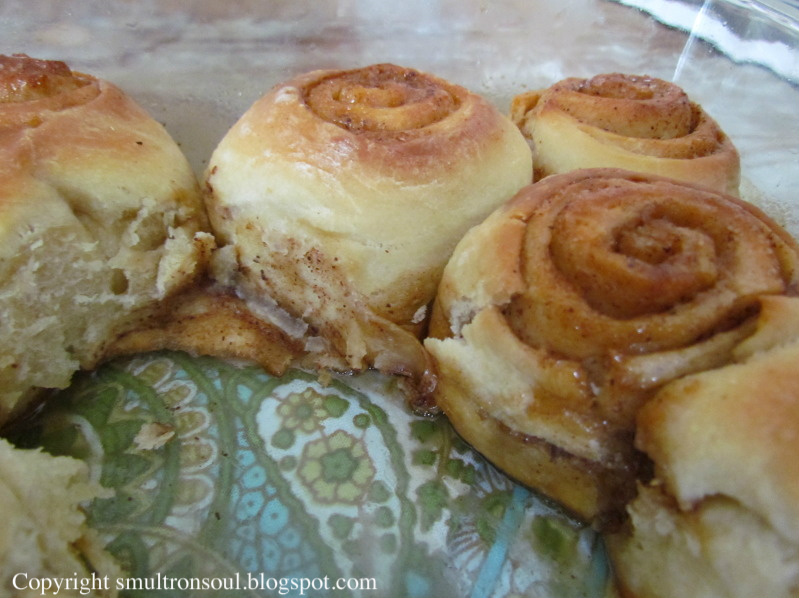 Cinnamon buns in America are more like a roll -- soft, buttery, overly sweet, goey. Also a perfect accompaniment to coffee but not at all good for the waistline. I love the flavor of butter and the softness of the American bun -- it's more like eating cake -- but I like the moderate level of sweetness of the Swedish bun. The Swedish bun could almost pass as a less guilty daily snack even, but you can't say that about the American one. Still, neither should be eaten everyday -- sugar deserves to be consumed in limited amounts, but when its time comes, there are plenty of reasons why baking at home is best. My recipe is a peaceful cross between the American and Swedish cinnamon bun. I am not that afraid to use butter in this recipe, but one could probably add more. These buns are soft even the next day and fill one with serenity. Oh did I mention that you don't need to knead this dough? 1. Proof yeast by adding yeast, sugar, milk and water into a large bowl. When the mixture is activated with bubbles, add flour, salt, egg, vanilla and knead in the butter. Form into a soft, slightly sticky dough, which means adding 1 - 2 tbs extra water is probably beneficial. Cover and refrigerate overnight. 2. In the morning, take the dough out of the fridge, deflate it, and leave out covered for 1 or 1 1/2 hours -- until it's at room temperature. 3. On a lightly floured surface, roll into a very thin (about 1/4 inch thick) rectangle. Slather with 3 or so tbs butter. Mix cinnamon and sugar and sprinkle evenly. Make sure to get the edges. 4. Starting from the wide side, roll the dough very tightly and thinly into a log. If there is excess flour as you roll, make sure to it brush off. Cut the log into 8 pieces. Arrange in a pan (mine was a glass rectangle pyrex, 8 x 6 x 2 inches) that is greased generously with butter. Let proof for 40 minutes covered with a tea towel. 5. Brush the top with extra butter, if desired, to give a soft exterior. Bake in a pre-heated 190C/375F oven for about 20 minutes, until light brown and when a skewer or toothpick comes out clean. Let sit about 20 minutes before indulging.